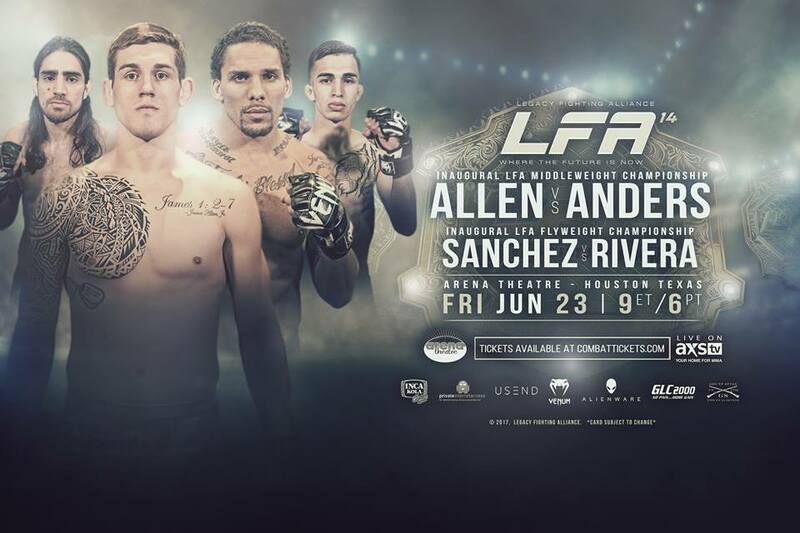 Over the weekend Legacy Fighting Alliance (LFA) announced that it would be returning to Houston, Texas’ Arena Theater on June 23 with a championship doubleheader for their event LFA 14. In the co-main event, undefeated Jerome Rivera (7-0) of Santa Fe, New Mexico will be in hostile territory as he faces Houston native Roberto Sanchez (6-0) for the Inaugural Flyweight Title. will be facing a stern test with Sanchez, 31, who has submitted his last five consecutive opponents. LFA has recently served a pipeline league to the UFC and a victory over a fellow undefeated fighter would catapult the winner of the contest up the flyweight rankings. In evening’s main event, Brendan Allen will be taking on Eryk Anders for inaugural LFA Middleweight title. LFA 14 will air live June 23 on AXS TV. LFA 14 card features two title fights.